Time is of the essence, wouldn’t you say? Do we have the KNOWLEDGE about what vitamins & additional nutrients we should be consuming? Do we know how much of them we need, and what to take with them? Do we find it difficult to keep up with where health trends are going, and understanding what is right for us as individuals? Most significantly, how many of us have difficulty finding the TIME to buy the supplements, make the smoothies and re create the recipes that health bloggers post every morning (including me/myPOW)? This is where my friend VITL comes in. Personally, I do prioritise finding the time to learn the ins and outs of health trends, and from trial and error I know what I want to be consuming everyday to feel my best. However, finding the time to maintain this is very hard. Discovering VITL has really helped make my wellness routine so much easier. Not only are the products delivered to me, but the supplements and Vitamins are portioned out in easy sachets. Also, if I don’t find the time to use the sachet (which contains all my favourite superfoods in it) with an interesting recipe, I can just slip it into my water! What makes VITL so good? Apart from convenience & ease, you can be certain that you’re consuming what you actually need to support an optimum healthy lifestyle. The products have been formulated by a certified top nutritionist, the vitamin combination covers what you need for your mind & body wellness, there are no nasties involved, it is low in sugar and you will GENUINELY find yourself feeling more energised & focused throughout your busy day. The Vitamin & supplement formulas are aimed to help boost your immunity, wellbeing, energy and mental clarity, naturally. I gave the products a trial and took my time to determine what I thought of them. Not only am I very picky with what I put into my body but I am rather set in my ways, knowing what works for me and what I need to feel fabulous. However, I have really developed a love for VITL products and have enjoyed making them a part of my wellness routine, which I hope you will experience too. 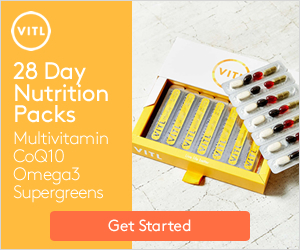 To try out VITL, click the banner link below and use my coupon code VTAMMYPOW to receive 50% off any purchase! Please #mypow (my Pursuit Of Wellness – a healthy venture of mine) with images of you and your VITL products, and any creations too! Let VITL help you live a little better, everyday.